Any serious fashion loving maven is familiar with the wonder that is Monique Lhuillier. From the swoon-worthy bridal collections to the over-the-top ready to wear to the fine jewelry and even shoes, Lhuillier crafts a feminine, ultra-high-end dream ensemble. 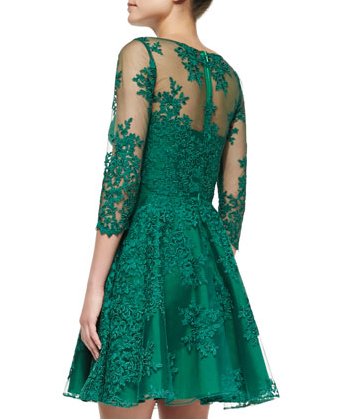 Imagine my surprise when I was reviewing my daily fashion emails and came upon a lovely little ditty from Neiman Marcus featuring an affordable, gorgeous, green party dress by ML Monique Lhuillier. ML, the sister brand of it’s luxury namesake, features many of the designers best selling details, lace, chiffon, and curve hugging cuts, but retails for a mere fraction of the price. An internet search ensued… and here are my favorite ML party dresses: the 3/4-Sleeve Lace Illusion Cocktail Dress in green, the Jersey and Lace Gown in black, and the Strapless Box-Pleated High-Low Gown. Happy Shopping!